Three Blackhawks prospects recently received postseason honors from their respective conferences. 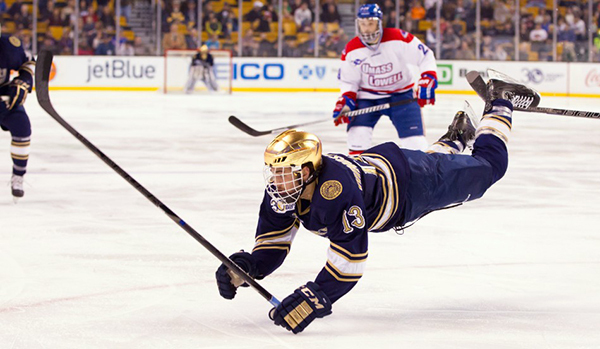 In Hockey East, Notre Dame forward Vince Hinostroza was named a first team all-star, and Vermont defenseman Mike Paliotta was named a second team all-star. Paliotta and Vermont are still alive in the Hockey East playoffs, which continue with semi-final action in Boston on Friday night. Denver defenseman Nick Mattson was named the Scholar-Athlete of the Year by the NCHC. Mattson led North Dakota defensemen in scoring with 15 points (three goals, 12 assists) in 19 conference games. He is a management major with a GPA above of 3.9. Vermont just lost to UMass Lowell so the Catamounts season is done, as is Paliotta’s college career. Hope that Hawks get the Paliotta 2-year-deal done this weekend. I also wonder if the Hawks might be one of the teams after Penn State’s Casey Bailey. Late bloomer, big kid, hard shot. Not sure what his upside is but he’s getting lots of positive press. Happened to be watching the Miami game last night and Anthony Louis made an amazing play to set up their 5th goal. If someone can post a link from you tube it would be great. I know his size is a big issue but he looked like a mini- me version of 88 on this play.